It’s rare. It’s hoppy... and it’s delicious! 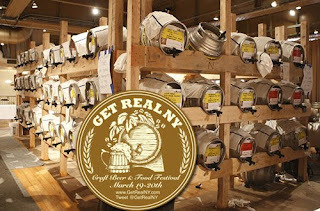 It’s Get Real NY’s Craft Beer & Food Festival! This weekend, it’s “March Madness” and “Sunday Funday” at the Altman Building where, in 3 delicious hours, you’ll get to sip on more than 80 (!) brews from local and North American breweries. Plus, sample artisanal foods from more than 20 NYC food trucks and restaurants. Featuring a cask bar with the likes of Sierra Nevada Harvest, Green Flash Double Stout and Lagunitas Brown Shugga, plus food vendors like Brother Jimmy’s, Luke’s Lobster, and Murray's Cheese, the Craft Beer and Food Festival has something for everyone! Bonus: Get a souvenir glass with admission!